From her studies in Paris, to trunk shows with Diane Von Furstenberg and CHANEL, to behind the scenes at Mercedes-Benz IMG Fashion Week and Prêt à Porter Paris, Jordan brings to the table a penchant for establishing new concepts to achieve brand promotion and recognition. Her commitment to anticipating the needs of both clients and media alike has kept her finger on the pulse of the trends in fashion world. Through her extensive work launching emerging brands to become household names, Jordan brings with her a passion for the industry, innovative, out-of-the-box marketing concepts, as well as an unparalleled attention to detail which she implements into every element of Haute House PR & Marketing. After several years at her previous PR firm, Jordan quickly rose to the top, serving as second in command to the owner as Director of Product Placement & Publicity overseeing thirty five brands. Jordan was responsible for facilitating the editorial and celebrity placements for the agency, and spearheaded the rapid growth of the firm. The result of this initial partnership was the success of the firm’s established Women’s and Men’s Divisions through her success with editorial product placements, celebrity gifting, events and stylist initiatives. Jordan’s achievements in the editorial arena created big shoes to fill, as the first publicist at her former agency to garner her brand on the coveted cover of Lucky Magazine alongside 13 other press inclusions for her clients within the same issue. Additionally, Jordan continued to broaden her horizons serving as her firm’s unofficial on-camera style expert, appearing in a plethora of various celebrity trend segments on such major network such as Extra, E! News, TV Guide, and Saturday Night Magazine as well as several international media outlets. With her comprehensive background involving all aspects of the business; including client and staff relations and new brand development, Jordan’s sights were set high on her next endeavor—the launch, and highly anticipated success of Haute House PR & Marketing. 5 years later, Haute House PR has grown enormously, yet still remains committed to both customer service, and RESULTS. Combining her unique yet complementary skills with her seasoned team of expert publicists into a true force to be reckoned with, Jordan’s mission was simple: to provide brands with the best of both worlds through the launch of Haute House PR in June 2009. 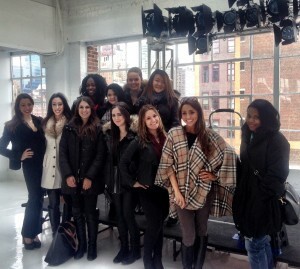 Having over 10 years of experience under their belt, the Haute House PR team is experts in every niche of the industry. Jordan’s skill set combined with the heart and soul that she and her team brings to the table, sets Haute House PR & Marketing apart from typical LA and NYC agencies. The firm features a boutique sense of attention to detail; but at the same time, brands reap the benefits of being represented by a full-service media agency. Haute House PR’s main focus is streamlined and effective, focusing on giving clients service that goes above and beyond to produce unrivaled results.